This small pool, set amid farmland six miles south west of Shrewsbury, has long been known as a site worth visiting to see birds but interest declined as the pool silted up and shoreline became overgrown with trees. In 2007 the owner of the land, Mr Tudor Bebb of Polemere Farm, with the support of John Tucker from the Blue Remembered Hills Project and the Environment Agency, arranged for the pool to be re-profiled and some of the shoreline was cleared. In addition a small car park was provided and a bird watching hide. 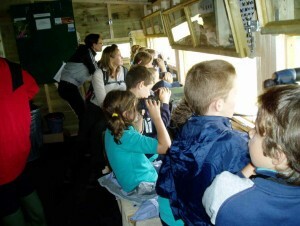 The hide was formally opened to the public on 15th June 2007 by Dawn Balmer of the British Trust for Ornithology in the presence of invited guests. Dawn had lived in Pontesbury as a child and Polemere had been a site that she regularly visited as a young ornithologist. She was responsible for one of the first lists of birds seen at this site (The Birds of Polemere 1956-1992). (Note: Dave Barrow has created a spreadsheet of the Birds of Polemere, currently updated to the end of 2017. Polemere is about 6 miles south-west of Shrewsbury at national grid reference SJ41310939. Click here for a map showing the site (marked by an orange arrow). Leave Shrewsbury on the A488 and, after passing through Hanwood, turn right at Lea Cross and head towards Nox. The car park is on the right-hand side of the road as you approach Polemere Farm. Alternatively, take the B4386 from Shrewsbury until you reach Nox where you turn left towards Lea Cross and the car park is on the left hand side of the road just past Polemere Farm. Take care as you enter or leave the car park as this road is used by heavy goods vehicles avoiding the bridge in Hanwood. Glacial ice 1 km thick covered this area 11-12 thousand years ago. As the glaciers moved away they left behind gently sloping hills and hollows. A hollow became lined with clay and has held water ever since – as Polemere. The natural cycle is now for the pool to fill in winter and for levels to fall during summer. Heath covered this landscape from the Stone Age (about 5,000 years ago) until agriculture and food production took over in the 19th century. During the 20th century Polemere became known for its numerous wintering waterfowl, mainly ducks and geese. Today these can number hundreds and rare birds may also be seen. Major re-profiling of the lake was carried out by the Environment Agency in 2006 and some of the vegetation was cleared away from the waterside. In the summer of 2007, a small car park was built and a bird-watching hide erected close the the water’s edge. To control the colonisation of the lake margins by willow and alder trees, Highland cattle will graze the site outside the bird breeding season. The landowner, Tudor Bebb, welcomes you to Polemere. Look at the log book in the hide to find out what birds have been seen recently and add your own sightings. Please note that there is no access past the hide around the lake and that school groups occasionally occupy the hide and lakeside. Winter is possibly the best time, especially when cold weather forces ducks and geese to gather together at lakes like Polemere. Regular visitors in good numbers are Wigeon, Teal and Mallard and many other species of waterfowl occur at times. Some feed on seeds blown to the water’s edge, some dive for whatever they can find under water, while others come for fish. Winter is a good time to look out for mammals – foxes may be seen and one day an otter will too. Watch out during the spring and autumn migration times when all sorts of birds can turn up! Whinchat or Wheatear might be sitting on fence posts, a sandpiper might lurk along the water’s edge or an Osprey might try to catch a fish – the more often you visit the more likely you are to see something unusual. Summer is the time for resident birds and some summer visitors to settle and nest at Polemere. Besides the usual common breeding water birds we have planted a Phragmites reed bed which should, in time, attract Reed and Sedge Warblers. We hope to add a shingle bank to attract Little Ringed Plovers to nest, along with a scrape to encourage Lapwings to breed. 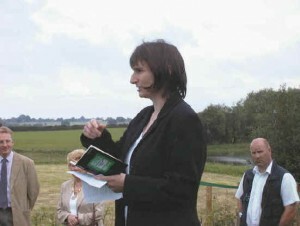 The Opening Ceremony for Polemere Nature Reserve took place on 15th June 2007. On a day when much of the West Midlands was awash with water, Polemere Nature Reserve was officially opened by Dawn Balmer of the British Trust for Ornithology in the presence of the Mayor of Shrewsbury, Councillor John Cooke, and the Mayoress, Mrs Cooke, together with invited guests. Although overcast, the rain held off for the opening. In his opening speech John Tucker, the Blue Remembered Hills Wildlife Sites Officer who had managed the Project, regretted the absence of the land owner Mr Tudor Bebb, who had been prevented from attending by a hospital appointment. He welcomed the Mayor and Mayoress and the other guests and paid tribute to all who had contributed to the success of the Project. He also welcomed Dawn Balmer from the British Trust for Ornithology who, as a young bird-watcher living in Pontesbury had often visited the site in the past and who had kept a list of the many species that she had observed on and around the pool. John then introduced Claire Fildes of the Blue Remembered Hills Project who acknowledged the help and support given by so many. 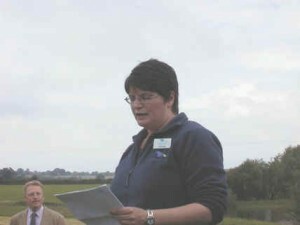 She then invited Dawn to formally open the reserve. In her opening remarks Dawn read out from pages in a notebook that she had kept during her days as a young bird-watcher at the pool. On this particular day, she had visited the pool on three occasions as she had seen three Greenshanks – birds which are uncommon passage migrants in Shropshire. Even today the presence of three such birds together would excite interest. She said that the new facilities, especially the hide, should encourage more regular observations on the site and hoped that some local bird watchers would adopt the site as their local patch as regular observations will soon add to the list of birds seen at Polemere. She then, in the presence of the Mayor and Mayoress, cut the tape leading to the hide and declared the reserve officially open. Guests then visited the hide to enjoy the refreshments provided. 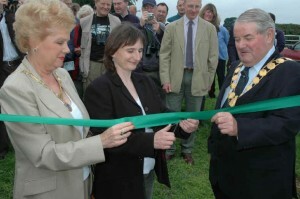 The cutting of the tape – the Mayoress, Mrs Cooke, Dawn Balmer and the Mayor of Shrewsbury, Councillor John Cooke. Children from the first school party in the hide at Polemere. Shortly after the event the first school party arrived to be led on a tour of the Reserve by staff from Shropshire Wildlife Trust who will be using the Reserve for education work. Acknowledgements: The Blue Remembered Hills project facilitated the conversion of Polemere into a nature reserve, a desire long held by the landowner Tudor Bebb. 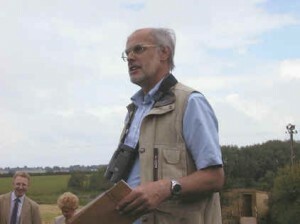 John Tucker, then BRH Wildlife Sites Officer, managed the project. The scheme has received financial help from: Heritage Lottery Fund through the Shropshire Hills Area of Outstanding Natural Beauty (AONB) and the Blue Remembered Hills project, Natural England, European Regional Development Fund, Shropshire Ornithological Society, Rural Communities Initiative Grants (via Shrewsbury & Atcham Borough Council) and Lady Gwen Francis. Help was given in manpower, machinery and materials by the Environment Agency (major lake restoration in 2006), Shropshire Wildlife Trust (education work), International Tree Foundation (tree planting), GO Davies (Westbury) Ltd. (grass seed), Nigel Farr (fencing materials & wood), Chelmarsh Ringing Group (Phragmites reed bed) and Tudor Bebb. Photographs: Martin Locke.